In the pantheon of guitarists, there is no higher deity than Jimi Hendrix. Born Johnny Allen Hendrix on November 27, 1942, in Seattle, Washington, Jimi Hendrix would transcend and transform into the Voodoo Child that melted the minds of millions for decades to come. With whip-like strums of his now-signature Stratocasters, Hendrix was a force of nature, cutting down mountains and opening hearts to the power of love, danger, and rock ‘n’ roll. More than any other guitar player, he wielded the Strat like a talisman, helping imbue the instrument with magic and symbolic power. But the stone-free southpaw actually played a number of guitars that—gasp— weren’t Stratocasters. When he died at the age of just 27, he had a variety of guitars in his collection, spanning from his time as a pick-up musician to the peak of his international fame. In honor of what would have been Jimi’s 75th trip around the sun, we’ve decided to profile some of the coolest and most notable “forgotten” Hendrix guitars. Very early in his career Jimi Hendrix was known to play a hardtail, single-lipstick-pickup Danelectro Shorthorn—perhaps the most out of character of any guitar on this list. While relatively well-documented, the Danelectro, like most of his pre-fame guitars, has a bit of mystery surrounding it. The exact model of Danelectro that Hendrix used has been disputed over the years. It has often been referred to as a red 1956 Danelectro U-1 even by “definitive” sources. However, based on the era, it would have most likely been a copper-colored, aka "bronze," 1958 Danelectro Shorthorn 3012. This was the standard model, with the “3012” denoting the copper color and “3011” models representing the famous black “tuxedo” models. According to most accounts, Hendrix purchased his Danelectro after his first electric guitar, a Supro Ozark, was stolen off the bandstand from the Birdland Club in 1960. At the time, Hendrix was dating a young woman named Betty Jean Morgan (who he'd unsuccessfully propose marriage to). Like any good bluesman who couldn’t marry his girlfriend, he named his new guitar after her instead and emblazoned her name on it. Despite his early attempt to settle down, young Jimi was a bit of a rambler and had become estranged from Betty Jean by the time he was picked up by police for stealing cars. Instead of doing jail time, Hendrix enlisted into the U.S. Army, joining the 101st Airborne Division in Fort Campbell, Kentucky. Initially the Danelectro did not join him, as he had left it at Betty Jean’s mother’s house. 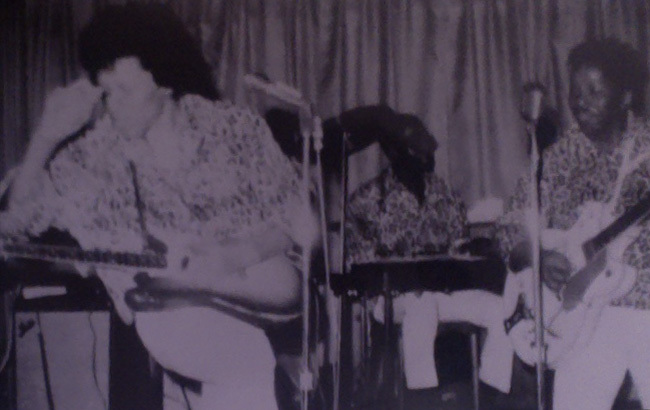 Jimi played Kay/Eko guitars in its stead, but eventually got his father to fetch the guitar for him and ship it. The Shorthorn then became his main guitar in the Army. He used it during his first jams with Billy Cox and during his earliest post-service gigs. 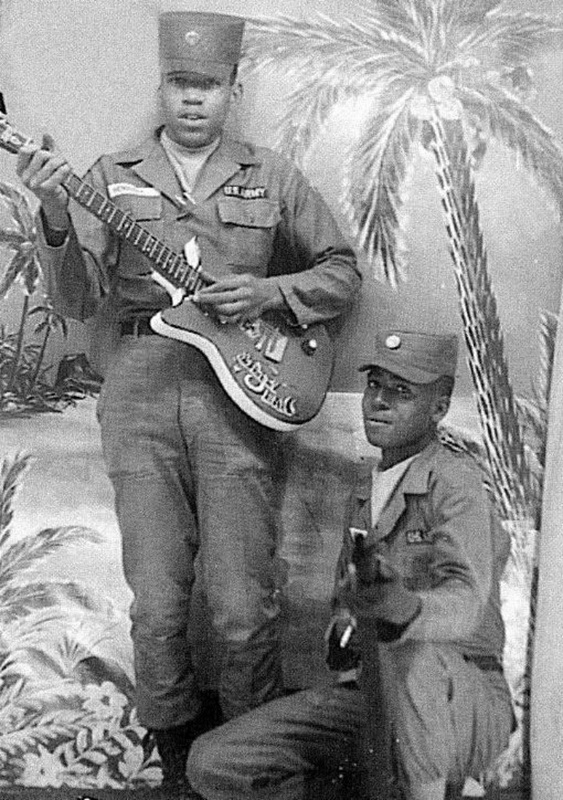 Upon his honorable discharge from the Army, Jimi was again left without Betty Jean (the guitar), having traded it away to another service member. Needing to get the guitar back, Hendrix is alleged to have broken back into his former camp to reclaim it. As Hendrix later put it, "I found the guy and told him that I had to have the guitar back." 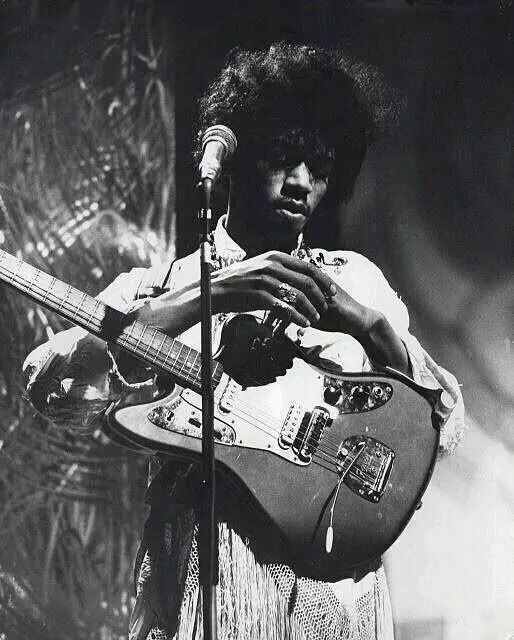 Like Hound Dog Taylor and many impoverished musicians of the time, Jimi wasn’t the most respectful guitar owner (the man did famously burn guitars). Hendrix would often pawn his prized guitar off before gigs, borrow another guitar for the show and then buy his guitar back after he was done playing (a money-making trick which didn’t always work out because of shady promoters). He finally traded away Betty Jean for good for an Ibanez Rhythm Maker at Collins Music Store in Clarksville, Tennessee. 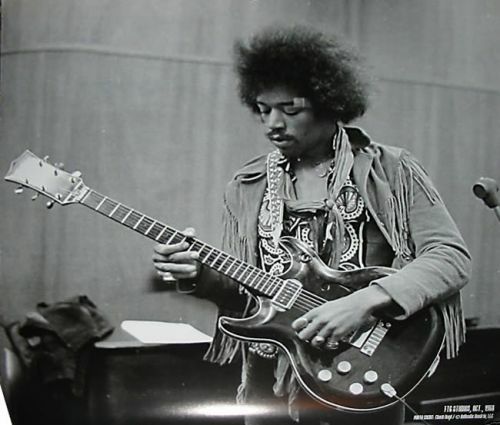 Hendrix then ultimately returned this Ibanez after defaulting on payments and eventually purchased his next main guitar, an Epiphone Wilshire. Since then, Betty Jean has never surfaced for sale, though if it does still have the “Betty Jean” inscription, it might be pretty easy to spot. In news that might surprise the most devoted Stratocaster and Hendrix enthusiasts: Jimi Hendrix played offsets. Yes, pre- and post-fame, Jimi Hendrix had a genuine love and appreciation for Fender’s atypical offerings. 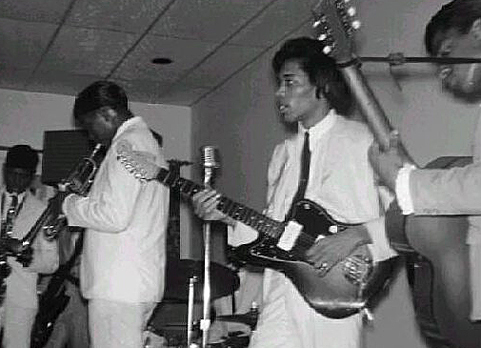 Jimi got his first Fender in 1964—a Fender Duo-Sonic, likely from 1959. The guitar was a blonde model with a rosewood fingerboard, black pickups, and a white pickguard. This was Jimi’s first introduction to the single-coiled Fender sound that would come to define much of his career. During his nine-month stint with the Isley Brothers in ‘64, the Duo-Sonic would be his main guitar. In the spring of that year, during a week where Hendrix had strayed from the Isleys before being replaced, the Duo-Sonic was “stolen” (you’ll notice a pattern here). Hendrix wouldn’t be long without a Duo-Sonic, as bandleader Curtis Knight would gift Hendrix a sunburst ‘64 Fender Duo-Sonic in 1965. This sunburst model became a regular weapon for Hendrix while he was a sideman, until it met a mysterious fate in the summer of that year. Jeff “Skunk” Baxter (of Steely Dan and more importantly, Manny’s Music) claimed that Hendrix traded in the sunburst Duo-Sonic as part of his first Stratocaster purchase, while others have surmised that Hendrix returned the guitar to Curtis Knight. As it stands, the Jeff Baxter story is the one that seems to check out more. Whatever the initial fate of the guitar was, both of the Duo-Sonics are said to have had a happy ending: They wound up in the possession of the legendary Patti Smith. The sunburst apparently even ended up being used by Tom Verlaine of Television! Before he was the textbook Strat guy, Jimi regularly and enjoyably committed the cardinal sin for “real” Fender blues players: He played a Jazzmaster. Remember that “stolen” Duo-Sonic? Well, when singer and founding Isley Brother O'Kelly Isley got Hendrix a new guitar, he bought what would become the first of several Jazzmasters to pass through Jimi’s hands. The first Jazzmaster was a pre-CBS sunburst model with soapbar pickups, and it would become his main guitar on tour with Little Richard and others. Jimi played this guitar as he would his Strats—restrung and upside down—but with the strap button relocated for comfort. The word is that Hendrix did not own a case for the guitar and would actually carry it around in the open. It is claimed in Jimi Hendrix Gear that Hendrix pawned the Jazzmaster off in October ’65 to be able to afford rent. However, he was photographed with this guitar as late as November ’65, so it’s possible that he pawned the Jazzmaster off and repurchased it, as he had with Betty Jean before ultimately parting ways. Because Hendrix was not an international name at that time, the guitar was thought to have been lost for decades and only recently surfaced in the possession of Rudy's Music in NYC. Around that same time in late '65 into '66, Hendrix was photographed occasionally playing a white, matching-headstock Jazzmaster with Curtis Knight and Wilson Pickett, which, like the sunburst Jazzmaster, was right-handed, with strings reversed à la Hendrix's normal style. While these photos could suggest that Hendrix owned the white Jazzmaster, it's also possible that the guitar was a loaner. As we've discussed, Hendrix did have a tendency for disappearing guitars (necessitating the borrowing of another). The white Jazzmaster is not commonly placed in his ownership. Jimi’s next Jazzmaster is one that is a bit more personal to this writer and, I’m assuming, to Jimi himself. During one of the two Xavier gigs, it has been stated that Hendrix popped a string twice on the same Stratocaster that night (and even restrung the Strat himself while the crowd waited) before ultimately switching to his new Jazzmaster for the rest of the set. Even though Hendrix is on record stating that he bought the guitar for “recording purposes,” he ended up using it live over the course of the next several shows. It is believed to be owned now by Steven Seagal. One of the more interesting cases for Hendrix and his offsets is his Jaguar. Singular. 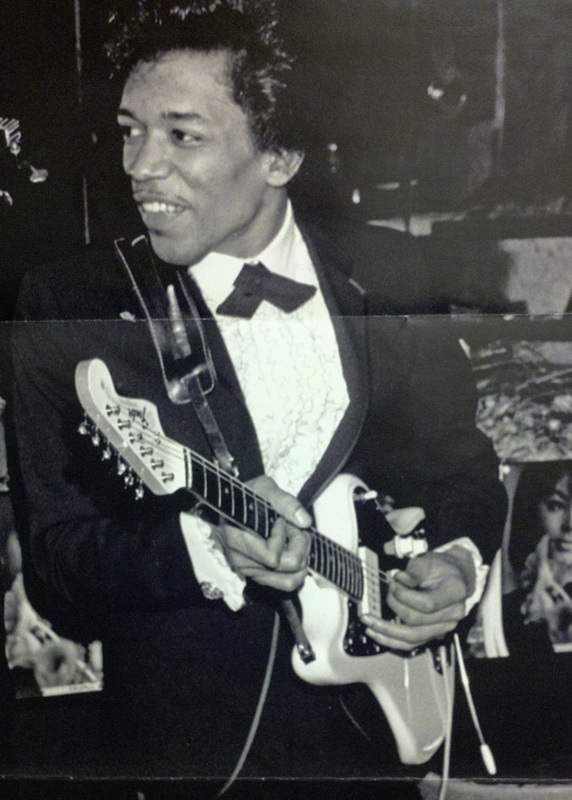 Hendrix was photographed playing multiple Fender Jaguars, and because of this, there has been a bit of confusion over which guitar actually belonged to him. From our research, it appears that Jimi only owned one Jaguar and it was given to him by The Rolling Stones’ Brian Jones in 1966. It ended up in the possession of famed roadie Tappy Wright (as did a number of forgotten Hendrix guitars). Once and for all, Jimi’s Jaguar is a black (with a blue-ish hue) CBS Jaguar with block-inlays and a matching headstock. The photographs of Jimi Hendrix playing a blue CBS Jag with dot-inlays in 1967 is, according to the best available information, a loaner guitar. 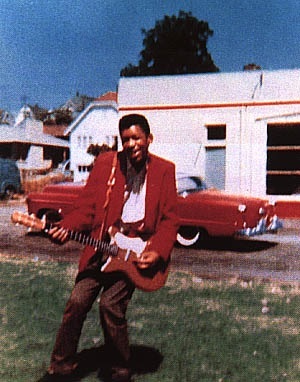 In the most widely-circulated photos of the loaner, you’ll see that the guitar is right-handed and still strung that way—suggesting that Hendrix was borrowing the guitar from a right-handed player on the spot and was just being Hendrix (aka a bad motherf*****)—while someone snapped some pictures. It also appears that Jimi’s Jaguar is currently up for sale, so if you have $125,000 or so, it can be yours! It’s hard to have a favorite forgotten Hendrix guitar if you’ve never played it, but the story behind Jimi’s Acoustic/Bartell Black Widow is, to say the least, memorable. But before we get into that, there's a bit of confusion over whether or not the guitar was an Acoustic or a Bartell and how it was branded. While there aren't a wealth of pictures out there to 100 percent determine how the guitar was marked, the time of production and features such as a 22-fret neck, double f-holes, and an elongated headstock suggest that it was in fact a Bartell. Interestingly enough, when the guitar recently came into legal controversy when it came up for auction after allegedly being stolen from Experience Hendrix LLC, it was regularly reported as being an "Acoustic." "When I finished showing him some things, he just held out his hands and said, "Gimme." He starts playing that thing, starts tape rolling, and I'm going, "Why do I even play guitar?" He finishes playing. I answered all his amp questions, and said, "I gotta go. Can I have my guitar back?" He says, "My guitar." I say, "No, that's my guitar." He starts laughing and says, "Not anymore! Now it's my guitar!" I say, "Hey look, I'm not a salesman. I play in a band, Sweetwater. What am I gonna use?" He points at the floor where four of his white Strats are laid out and says, "Help yourself!" Of course I wanted another Black Widow. I called Steve Marks and told him what happened. He said, "He wants it? Give it to him! Don't worry. You'll get one back!" I take one of Jimi's Strats to use. Like a dummy, I didn't have him sign it. I'm gonna play this guitar on the road, and I hate it!" According to Gerst, he would later return the Stratocaster to a confused Hendrix—this was just Jimi’s way of trading guitars (aka, you got Hendrix’d). Gerst was not without the obvious regret years down the line when other early Hendrix-owned Stratocasters went to auction. Another guitar that is decidedly not a typical Hendrix guitar: the hardtail Les Paul. 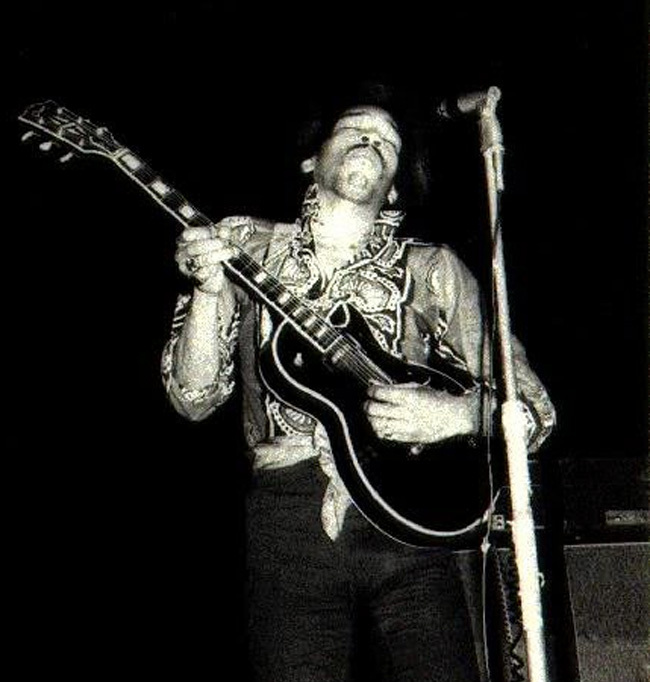 But indeed, Jimi Hendrix owned a black, hardtail 1956 Gibson Les Paul Custom (serial #611854). Hendrix first purchased the guitar in April 1968, according to the book Jimi Hendrix Gear. He played the Les Paul at various points throughout that year, as he also experimented with a Flying V and SGs. He was filmed live that year using this guitar on “Red House” in the same way he used those other Gibsons—in search of a more blues-friendly sound. It is possible that he used the LP in the studio as well, but that hasn’t been confirmed. Like the other forgotten Hendrix guitars profiled here, there is some confusion about this guitar—notably when he acquired the guitar and which black Les Paul belonged to army-buddy and fellow musician Larry Lee. It has been stated that Hendrix acquired the LP back in ’62 with Larry Lee’s help, but it was actually Larry Lee who purchased that Les Paul. That guitar was actually a Bigsby-equipped 1955 Gibson Les Paul Custom (serial #56043) that Larry acquired and later played as a rhythm guitarist during Jimi Hendrix’s unforgettable performance at Woodstock in 1969. Despite the guitar not belonging to Hendrix directly, Experience Hendrix did purchase this Les Paul Custom in 1991 for $19,800.